Whether you’re waking up early to start your work day, or staying up late to finish that essay, you can’t go without a cup, or two or three, of coffee to keep you energized. With a Keurig machine, it’s easy to just pop in a pod of your favorite brew and have a fresh cup in seconds; but as time goes on, pods pile up. Millions of single serve plastic coffee pods, though recyclable, end up in landfills each year, according to several articles in The New York Times, The Atlantic, and others – enough to wrap around Earth over 10 times. There is a new 100 percent compostable pod designed for a more sustainable approach to the fastest growing brewed drink in the U.S. 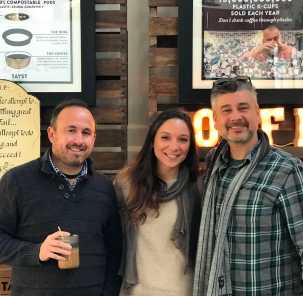 The pods, which are 100 percent compliant with Keurig machines and are made from renewable and plant-based materials, were created by the company Tayst Coffee, founded by Post (‘96) alumni Gregory Byrnes and Craig Handleman. 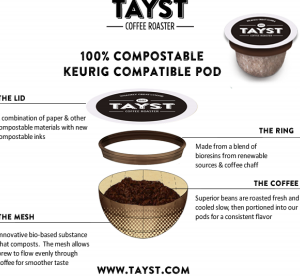 While Keurig and other companies have moved towards creating more eco-friendly coffee cups, the creators of Tayst Coffee wanted to create a product that came as close to leaving a zero carbon footprint as possible. The goal at Tayst Coffee is to eliminate 20 million plastic pods by 2020. “We’ve replaced over three million plastic pods [so far],” Byrnes said. Tayst works with more than 100 universities across the U.S. like Notre Dame, Hofstra, UCLA and the University of Michigan to name a few, to implement sustainable change in their offices by using their environmentally friendly coffee pods. They offer a free sample box to offices interested in trying their products. The BPI certified sustainable pods are decomposable and break down “swiftly and safely” within 41 days and leave zero waste, according to Tayst’s director of sustainability programs and Post alumna Kristen Royal (‘18). The coffee is sourced from Rainforest Alliance farmers, where each cup supports the soil the coffee is grown in, the farmers and their communities. People who use Tayst pods “get better flavor coffee because our mesh is more porous than the plastic,” Byrnes said. Royal attended Post as a graduate working towards her masters in environmental sustainability and science. Through her research on sustainability with Dr. Scott Carlin, professor of Geography, Royal met Byrnes and Handleman at AASHE, the association for the advancement of sustainability in higher education, a sustainability convention in Pittsburgh, Penn. in October 2018. In conversation, the Tayst owners were impressed with her knowledge on the global supply chain and her sustainability research, and later offered her a position as director of sustainability programs for Tayst. As director, Royal talks to, educates, and works with university departments (usually sustainability departments) about the company. She also helps develop case studies and provides insight to university students and staff to motivate offices around campus to switch to Tayst pods and why it’s important. “We are working with individual offices and those universities and developing procurement relationships with some as well,” she said. Outside of universities, she also develops and integrates programs in the business by building relationships with composting facilities, ocean clean up projects and working on developing benchmarks for the company in sustainability as they move forward. Royal worked as a graduate assistant for Carlin in the spring 2018 semester as she worked on her masters, developing programs that aligned with the United Nations 17 sustainable development goals (SGDs); these goals included a plan for progressive change in climate change, health, gender equality, access to quality education, environmental issues and more in several countries by the year 2030. 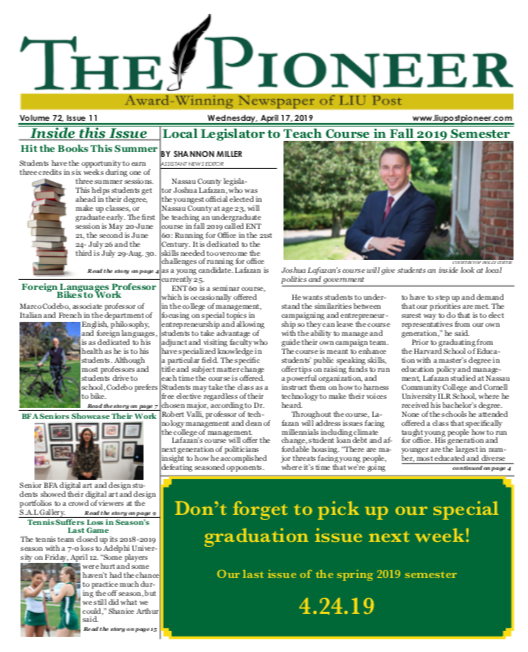 According to the paper, GTLIU is a collaborative platform that is local and global; it mirrors our own LIU community. The platform strengthens a variety of analytical, creative and communication skills using online learning modalities and it pushes students toward experiential, service and action- oriented learning. “I was very pleased with the results,” Carlin said. Royal credits some of the success of getting her job to her time at Post. Carlin agreed, saying the key to getting a job is networking, internships, attending local and regional conferences, learning about what companies are out there. “The face to face opportunities are invaluable,” he said. “One of the things Kristen has is an optimistic personality; it’s very helpful for students to be aware that how they present themselves is important. It’s really advantageous to research and study the company you are interviewing with,” Carlin advised. Royal has been working for Tayst for almost two months. In that time, she has visited colleges to educate and inform students and staff on sustainability, offer guidance and create programs around sustainable initiatives, starting with changing the amount of plastic waste due to single serve coffee pods in university offices. She wants to bring her work to Post. “[When] reaching out to LIU, I discovered that a lot of departments and offices purchase their own coffee and supplies individually,” Royal said, which makes talking about and implementing Tayst coffee pods difficult. She wants to come back to Post and encourage the students and staff to start more sustainable initiatives campus wide.